In Gendered Lives, Livelihood and Transformation: The Bangladesh Context, editors Meghna Guhathakurata and Ayesha Banu bring together contributors to explore women’s lives and livelihoods during the transition from a subsistence economy in rural Bangladesh. This well-written volume communicates the sense of belonging, interpersonal bonds and new hopes for continuing survival among the marginalised social groups in rural Bangladesh, finds Sajal Roy. Gendered Lives, Livelihood and Transformation: The Bangladesh Context. Meghna Guhathakurata and Ayesha Banu (eds). University Press Limited (UPL). 2017. Gendered Lives, Livelihood and Transformation: The Bangladesh Context, edited by Meghna Guhathakurata and Ayesha Banu, is a collection of well-written essays by leading academics, development professionals and feminist activists. The book predominantly documents the rural lives of women and their livelihoods during the transition from a subsistence to political economy in Bangladesh. This transformation is affecting the capacity for sustainable development and the quality of life of marginalised social groups on the basis of their gender and class. Essays in this brilliant volume focus on ageing women from the ‘untouchable’ ethnic communities, poverty-stricken disaster survivors and slum dwellers. The elderly women within these social groups have experienced extreme poverty (locally known as monga) and state-led inequalities in land ownership as well as the benefits of social safety net programmes, such as the living allowance for widows. The book offers interesting case studies about the impacts of extreme poverty and marginalisation on women’s roles and the division of their labour in Jhum cultivation in Garo communities (a method of shifting cultivation, also commonly known as ‘slash and burn’) and on women’s livelihoods in the Munda and Rishi (untouchable) communities. 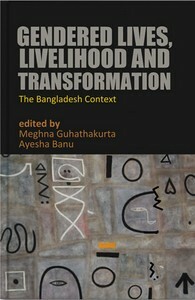 The case studies in this book include analysis of the process of graduation from poverty to resource-poor in the context of the feminisation of poverty and households alongside the socio-economic complexities around ageing and the livelihood vulnerabilities of slum dwellers in the capital city of Dhaka. These are the outcome of fieldwork conducted in the northern, north-western and south-western rural regions of Bangladesh. In the introductory chapter, the editors focus on the dynamics of Bangladesh’s transformation from a subsistence to a capitalist economy. Their long-established expertise on the development process has been utilised to explore the everyday lives of the marginalised women. ‘Agriculture was once the basis of the socio-economic structure of Bangladesh, but in the last forty years the rain-fed agricultural subsystem has undergone a transformation’ (1). 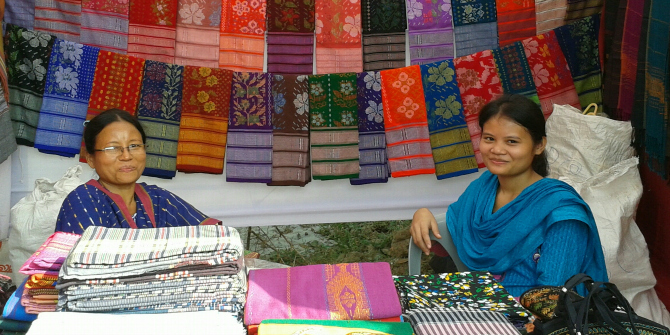 The complex dynamics of socio-economic transformation include poor women’s decreasing reliance on agriculture for livelihood, increasing rates of migration from rural villages to cities and booming employment opportunities in the readymade textiles industries. In the subsequent chapter, Soma Dey and Runa Laila document the changes in livelihood assets, the reduction of existing vulnerabilities and the adoption of new livelihood strategies by the Jhum cultivator women of an indigenous Garo community in the Modhupur Sal forest. The changes include the reconstruction of Jhum cultivation as a means of sustainable livelihood and the breakdown of socio-environmental relations against a backdrop of state-community conflict over natural resources. Hameeda Hossain and Suraiya Begum examine the reconfiguration of livelihoods and life patterns of women in the Munda and Rishi communities of south-west Bangladesh in the sub-district Shyamnagar Upazila in Satkhira. The main causes of this have been the constraints on local agricultural production systems due to salinity intrusion in the cultivable land and, at the same time, the growth of export-oriented shrimp cultivation. Both the Munda and Rishi communities have an ignored but rich colonial oral history as their ancestors were brought by the Zamindars (landowners) at least 250 years ago from Chotta Nagpur and Ranchi, India, to expand the service of British rule and clear the Sundarbans forest to develop agriculture. The Rishis, who believe in Hinduism, are treated as a Dalit caste, an untouchable community, due to their traditional occupations of cleaning animal hides, rearing pigs and making bamboo baskets. Both communities have experienced inequalities in education, employment and land ownership compared to members of the majority Muslim community. This has been happening for many years as there is no leadership by or representation of Mundas and Rishis in local politics. The constitution of Bangladesh does not recognise the Munda as an indigenous community: instead, they are treated as an ethnic community, though they have retained their own language and culture. In the following chapter, Fouzia Mannan and Banu outline how elderly women (including widows and divorcees) in the Joldanga slum in Dhaka experience ageing and livelihood vulnerabilities. They found that as well as single women with young children and women without male support, they are the most vulnerable group in the urban slums. The problems they encounter include begging as a sole way of earning livelihood in the streets and the deprivation of basic rights, including housing, food, clean drinking water, sanitation and medication. Overcrowding and the inadequacy of utilities are reflected in the high levels of urban deprivation in the Dhaka slums. Therefore, the slum residents have experienced severe threats to housing and their capacity to safely earn a living for many years. For adult females, there is a fear of uncertainty, insecurity and eviction by local land grabbers and politicians. Such challenges continually compel slum residents to adopt strategies (e.g. building self-confidence, sustaining harmony among the members of the community and maintaining relations with the local politicians of the ruling party) to cope with the severity of rapid urbanisation. The book does not address polices related to urban poverty, alternative income generation and state-sponsored employment, particularly for the elderly women living in the slums in Dhaka. It would have been useful if Mannan and Banu had outlined their own framework of livelihood vulnerabilities in urban slums, since livelihood earning is significantly context-specific. They also neglect the experiences of ageing among men, which affects their capacity to earn their livelihoods in the face of rapid urbanisation in Dhaka. Gendered Lives, Livelihood and Transformation: The Bangladesh Context will be of benefit to undergraduates, postgraduates, development professionals and urban policymakers who are interested in the economics of poverty, area studies and gender and development studies. Essays in this book consider only ‘elderly women’s experience of livelihoods’ and their vulnerabilities, which may elide the distinction between women’s lives and the ‘gendered lives’ of the book’s title. Despite this, it communicates a sense of belonging, interpersonal bonds and new hopes for continuing survival among the marginalised social groups in rural Bangladesh. This review was first posted on LSE Review of Books and can be viewed here. The review gives the views of the author, and not the position of the LSE Review of Books blog, or of the London School of Economics. Sajal Roy is a PhD Candidate in the Institute for Culture and Society, Western Sydney University, and Assistant Professor in Women and Gender Studies, Begum Rokeya University, Rangpur (BRUR), Bangladesh.